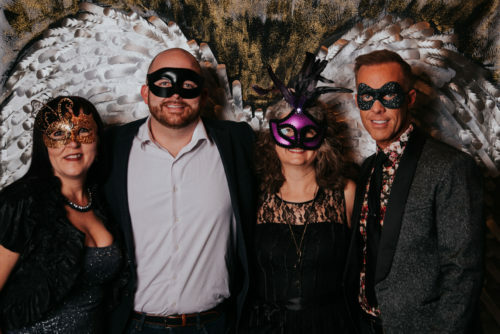 A Masked Night to Remember! As people start to arrive dressed to impress and masks on. The food looking spectacular as the staff bring it around. The room is all set and looking beautiful, the musicians playing beautifully in the background, silent auction sheets start to fill up and the raffle and 50/50 tickets line up is growing. I think everyone that took time to help with this event is thinking the same thing…. This is going to be an amazing night! 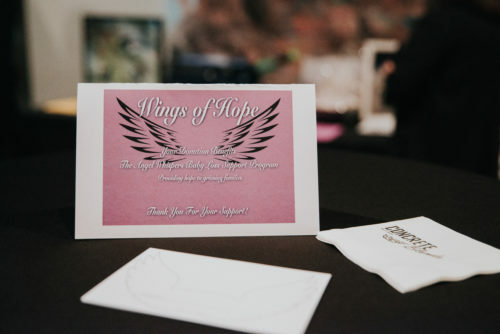 The Angel Whispers Baby Loss Support Program (a program of Fort Saskatchewan Families First Society) provides programs and supports to families that have experienced the loss of a baby to miscarriage, stillbirth, SIDS or neonatal death. Angel Whispers inspires hope & healing and offers compassion & understanding to families devastated by the loss of a baby. Angel Whispers provides confidential individual and group support to broken-hearted parents grieving the loss of a baby during pregnancy or after birth. The program allows grieving families to connect with other parents on their grief journey so that they need not to walk their journey alone, providing a safe place to share and grieve the loss of their precious babies. Angel Whispers is a vital program in our region that relies on donations, grants, fundraisers and community partnerships to sustain supports to grieving families. For more information on the Program please visit Angel Whispers Baby Loss Support Program on Facebook or their website at www.angelwhispers.ca/angelwhispers. 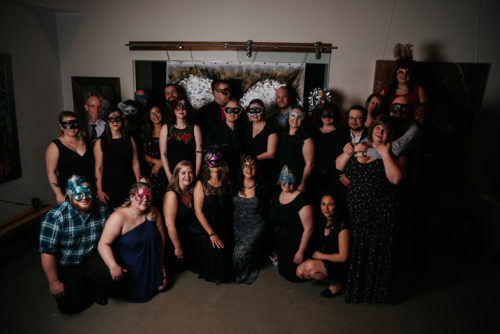 When the Lori-Ann from Angel Whispers Baby Loss Support Program and Heather from Families First in Fort Saskatchewan approached us with the idea of doing a Gala style Fundraiser for the Angel Whispers Baby Loss Support Program it was a no brainer. We are in, what can we do and how can we help! We started with an amazing committee six months before the date with a monthly meeting and everyone bouncing ideas, bringing forth contacts and an amazing group of people that all had the same end goal in mind… “How can we raise the most money for this incredible program and have the best night while doing it!” When the masquerade idea was brought up it was quickly a unanimous decision that this was perfect for the event, with the meaning behind it that most of these families that suffer these unimaginable losses feel like they are having to put a mask on every day just to leave the house or talk to people. Lesley – I’m still trying to learn its ok to grieve for my losses, to not feel I am so alone in this journey. Lori-Ann has gone above and beyond in my unique situation to be by my side as I struggle with the reality that is my new life. Having met other moms and dads that are struggling the same as I am has been so comforting. I don’t know where I would be mentally right now without the program. I’d be lost if it was not for Lori-Ann taking me under her wings and showing me a gentler side of grief and loss. I wouldn’t be where I am without that and I am forever grateful! Teresa – Angel Whispers truly was there for me when I had no idea where to turn. Miscarriage was a new thing for me, no one I knew had ever mentioned they had one or talked about it. When it happened to me I was overwhelmed; very emotional, confused and I felt very alone. Lori Ann met with me and immediately made me feel better with her caring, understanding and support. The gift of the feather angel wings was really the only thing I had to physically hang on to with my loss. The events and ongoing support are truly a blessing, they help you remember you aren’t alone and others have been where you are. No longer feeling isolated has helped me immensely. I can’t say enough about how Angel Whispers and Lori Ann have been there for me during one of the most devastating times of my life. If not for them I really don’t know how I would have coped. The families that spoke that night about there loss and what the program has done for them was incredible! With the total raised not yet released as a few things are still being tallied up, we do know that we will be very close to the goal of $25,000.00!! This night was truly amazing, a huge thank you from us to everyone that helped out, donated a dollar value or a silent auction item and to every single person that came to support this amazing program. We thank you all and can’t wait to see you again next year! We are proud and honoured to support our Community in as many ways as we can! To find out what other events Straightline Chrysler will be at or if you have something you would like us to be a part of, contact us or come and see us at the dealership! Why is the 2019 Ram taking over the truck world?